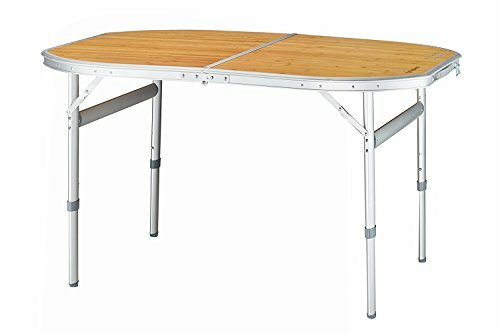 KingCamp portable strong stable bamboo folding table for 4 persons is perfect to be used indoor as a sofa table, or bring it to outdoor activities for picnic, camping, beach, patio parties, fishing, and more! The table leg can be adjusted into two heights, which can suit for the chairs of different height. The Bamboo desktop adopt the center fold design, aluminum bracket legs can be folded, hiding in the back of desktop, so it is easy to set up or fold in seconds when you need to use and store it at any time. The bracket legs are made of aluminum alloy and anode oxidation treatment, no rust, corrosion resistance and easy to clean up. The table can be folded to the middle from left and right. The table only weight 20.3 lbs and after folded the size only has 31.9 x 25.2 x 3.5 inches. It is portable and light enough to be carried like a suitcase on a trip, fits most car trunks, satisfying your camping needs. EASY SET-OFF: Center fold desktop design. Height-adjustable.